Eagles Rock Cottage is a cosy, spacious and comfortable retreat in the mountains overlooking the picturesque Glenade valley. The original 100 yr old cottage has been fully renovated. It is the perfect location for those looking for a private, quiet, get away. Perfect for a romantic weekend or as a base to explore this spectacularly scenic area. 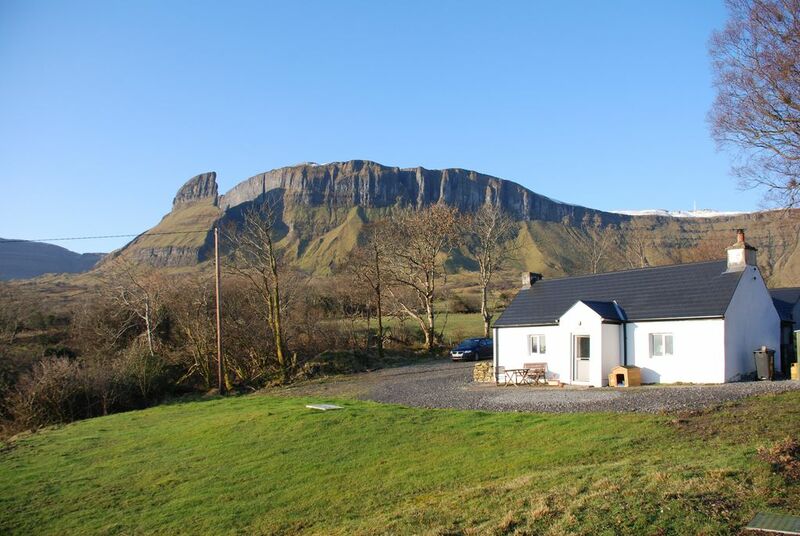 The cottage sits on over an acre of land and has spectacular views down the valley and back up the mountain. It has been renovated and extended recently to modern standards to provide added levels of comfort in this beautiful and very peaceful setting. There is a large kitchen, dining room and living room that takes up all of the original cottage. This room has the original stone fireplace which now contains a wood burning stove. In addition to this there is a utility room, a bathroom and two double bedrooms. One bedroom is normal size room with a double bed. The main bedroom is very large and has a king size bed, an en-suite shower, sink and toilet, there is also room for a fold down single bed in this room. The cottage is heated primarily by an energy efficient condenser oil burner. The system is timed but can occasionally be boosted, though we ask that our guests make fair use of the oil supplies given the price of oil and its environmental impact. There is a large wood burning stove in the living and dining room. This burns seasoned logs very well. A small supply of logs will be available for every visitor. Additional logs can be purchase in the Spar in Kinlough. The cottage contains a fridge, an electric oven, a gas hob, a microwave, a washing machine, a tumble dryer, a dish washer, a vacuum, an iron,a hair dryer, a tv, a dvd player, various lamps, two shaver socket lights, an fm/mw radio. We harvest rainwater from the cottage roof. The water is then filtered twice and uv sterilised. The result is beautifully clean clear water. It is ph neutral and free of chlorine and other damaging chemicals. We ask our guests not to pour anything down the guttering drains which may effect water quality. There is a good selection of books at the cottage. We would ask our guests to avail of these but to leave what they find. Outside there is a bench, table and chairs so that our visitors can enjoy the spectacular valley views with a cup of coffee. There is ample space for parking and for strolling. Wundervolle Tage in typisch irischer Landschaft zwischen Bergen, Seen und Meer. Haus in exzellenter Lage über dem Glenade Tal und ausgezeichnetem Zustand. Sorgfältige und umfassende Information und Betreuung durch die engagierte Vermieterin Christine. Sehr gute Empfehlungen für Wandern, Besichtigen, Essen und Trinken. Sehr zu empfehlen und bestimmt nochmal auf unserer Wunschliste.